Phil Salt has extended his contract at Sussex Cricket. The deal follows an impressive first full season for the 22-year-old batsman. Phil was Sussex’s second highest run-scorer in the 2018 Specsavers County Championship and the 14th highest in division two overall. The opener’s haul of 739 runs included two centuries; a maiden first-class hundred against Durham at Arundel in June and a spectacular 148 off 138 balls against Derbyshire at The 1st Central County Ground in August. 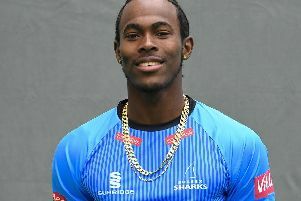 The Sussex Academy graduate also played an important role in Sussex Sharks’ run to the final of the Vitality Blast, scoring 355 runs at the top of the order, including four fifties. His strike rate of 172.33 was the team’s highest and the equal fifth highest amongst players in the tournament who played at least ten innings. Those performances have seen Salt selected by teams for the T10 League and Pakistan Super League this winter. “Sussex is definitely the place where I want to continue playing my cricket,” Phil said, “and hopefully I can play a part in something which has the potential to become very special. Sussex head coach, Jason Gillespie added: “We’re clearly delighted that Phil has agreed to continue his cricketing journey with us. “His attitude and efforts have been fantastic, and it was great to see his game develop last summer.